Charlie Conacher led the Toronto Maple Leafs to the 1932 Stanley Cup title. Fans of hockey today would find it incomprehensible to discover how revered Charlie Conacher had been during the 1930s. Prior to the introduction of television in the 1950s, the radio broadcasts of Foster Hewitt were the essential method of following the game, and radio listening was at its zenith during the desolate years of the Great Depression. If a single star evolved from that era, it was that of Charlie Conacher. Charles William Conacher was larger than life. Standing over 6 feet and weighing close to 200 pounds, he literally stood head and shoulders over most of his opponents and teammates. But it was his story that made him the hero of thousands. Born December 10, 1909, Charlie was one of ten children born to a family considered so poor, they "couldn't afford a tube of toothpaste." Benjamin Conacher was a teamster, driving his horse and wagon around the city doing odd jobs. He and his wife Elizabeth had five boys and five girls. Although the family was "poor as church mice," it was sports that led Charlie Conacher and his siblings out of their circle of poverty. The family lived on Davenport Road in Toronto, a neighbourhood that Charlie called "one of Toronto's higher-class slums." The Conacher children attended nearby Jesse Ketchum Public School, where they were encouraged by a schoolmaster to participate in athletics as sports were deemed as important as academics. All ten of the Conacher kids thrived in the humble schoolyard playground. Lionel excelled in football, boxing, wrestling, lacrosse, baseball and hockey, and in 1950, was named Canada's best athlete of the first half century. During his Hall of Fame hockey career, he starred with the Pittsburgh Pirates, the New York Americans, the Montreal Maroons and the Chicago Black Hawks. Roy starred with Boston, Detroit and Chicago during a hockey career that led to the Hockey Hall of Fame in 1998. His twin, Bert, was also an exceptional hockey prospect until a road hockey accident cost him the sight in one eye. The twin girls, Nora and Kay, were outstanding baseball players and track and field stars. And then, there was Charlie. Originally a poor skater, he began his hockey life as a goaltender, but diligently worked on his skating by the hour and eventually was recruited to play junior with the Toronto Marlboros beginning with the 1927-28 campaign. There, he was joined by future linemate Harvey Jackson. Charlie led the Marlboros with 11 goals during the 9-game schedule and helped his squad reach the Memorial Cup championship, where they were defeated by the Ottawa Gunners. His second season of junior was even more satisfying. Charlie led the junior league with 18 goals and 21 points, playing in just eight of the season's nine games. His torrid pace was equaled in the playoffs where, during the Memorial Cup final, Charlie scored seven goals facing Winnipeg, driving the Marlies to win the championship. 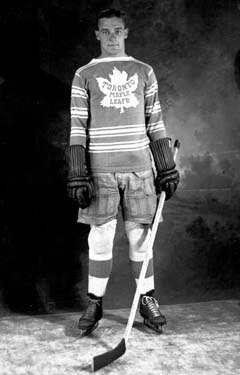 There was no doubt that Charlie was ready to play in the National Hockey League, and he debuted with the Maple Leafs on November 14, 1929, just shy of his twentieth birthday. By this time, he sported a powerful stride and a shot that was quickly considered the hardest in the league at that time. He was big, strong and fearless, and during an era when people were looking for heroes, Charlie provided fans with exactly that. In his first game, he scored on his first shift, causing newspaper accounts to state that he "made a splendid impression in his pro debut and was one of the best men on the ice." Conn Smythe, who served as general manager of the Maple Leafs, dictated much of what went on on the ice, and placed Charlie with Joe Primeau and Harold 'Baldy' Cotton, a great friend of Charlie's brother Lionel. But mired in fourth place, Smythe summoned Harvey Jackson (not yet nicknamed 'Busher') from the Marlboros. Late in his first game, he was placed on a line with Conacher and Primeau, but the trio wouldn't become a regular line until December 29, 1929. When they clicked, sportswriters tagged them 'The Kid Line,' now one of the greatest lines in hockey's storied history. Although abbreviated by an infected hand and tonsillitis, Charlie Conacher still scored 20 goals in 38 games during his first NHL season. Dubbed 'The Big Bomber' for his booming shot, Charlie terrorized opposing netminders and, in the process, scored a league-best 31 goals in 1930-31, yet another season hampered by injury. This time, a broken wrist took him out of action during much of December that season. The brash twenty-year-old put up with little nonsense on-ice. "It was like that in the old days. You had to be able to take it," declared Ed Fitkin in his book, 'The Gashouse Gang of Hockey.' "What amazed the veterans was the fact that 20-year-iold Conacher not only could take it but he could dish it out, as well. They began to treat him with a respect seldom before afforded a newcomer." Long-time season ticket holder Tom Gaston, now deceased, recalled that "he was just like a tank. Chuck was big and strong – not many guys would mess with him." By opening night of the 1931-32 season, the Maple Leafs were housed in a magnificent new arena – Maple Leaf Gardens. The Leafs' previous home – the Arena Gardens – simply couldn't accommodate the crowds who rushed to watch Toronto play, and much of that excitement could be attributed to Conacher and his Kid Linemates. 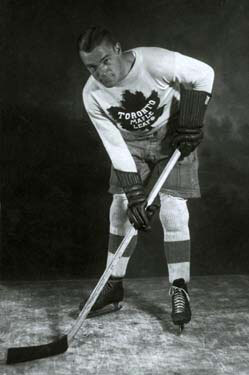 In fact, Charlie Conacher scored Toronto's first goal at Maple Leaf Gardens. That 1931-32 season was special in so many ways. For one, Charlie led the league in goal-scoring once again, this time collecting 34. On January 19, 1932, Charlie became the first Maple Leaf player to score five goals in one game when Toronto spanked the New York Americans 11-3. The netminder, future Hall of Famer Roy Worters, later became Charlie's partner in a Toronto hotel venture. But again, an injury curtailed his season, this time, caused by a broken hand. Missing three weeks likely deprived Charlie of a scoring title, and the Leafs the distinction of having the first, second and third top scorers during the regular season. As it was, Busher Jackson finished first with 53 points, Joe Primeau second with 50 points and Charlie Conacher fourth with 48 points. Howie Morenz of the Canadiens snuck into a third-place finish with 49 points. 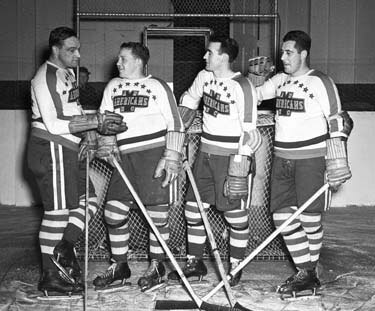 Charlie Conacher (far left) Busher Jackson (far right) and two New York American teammates gather around the net. Nevertheless, the Maple Leafs finished second in the Canadian Division and roared through the playoffs, finally capping a Cinderella season with a Stanley Cup championship. The city of Toronto celebrated like it had never before celebrated. Charlie was again among several heroes for the Leafs, leading the playoffs with six goals. Charlie slipped to 14 goals in 1932-33, but rebounded with three consecutive seasons in which he led the NHL in scoring. In 1933-34, it was with 32 goals and he had a career-best 36 in 1934-35. In both seasons, Toronto finished first in their division. Through the 1930s, the Maple Leafs' popularity was at its zenith, with the Kid Line front and centre in national popularity due to Foster Hewitt's national radio broadcasts of Toronto games on Saturday nights. And of all the players, Charlie Conacher was the most popular of all. Like many of his most avid followers, Conacher too had been poor, but Charlie rose above his family's poverty to become a sporting legend, applauded every step of the way by his legion of fans. 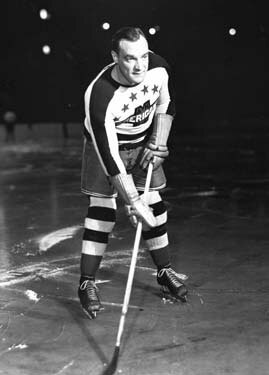 In addition, Charlie was named to the NHL's First All-Star Team in 1934, 1935 and 1936, and was selected for the Second Team in 1932 and 1933. However, inasmuch as the Kid Line was scoring at an astounding pace, the Maple Leafs were unable to win the Stanley Cup again. Conacher again led the league in goals scored in 1935-36 with 23, but by 1936-37, the dreams had all but evaporated. Joe Primeau had retired and King Clancy, a stalwart on defence, played but seven games before he retired. Charlie missed all but 15 games with yet another wrist injury. He played just 19 games the next season, suffering from a dislocated shoulder. The series of injuries reduced Charlie Conacher to a shadow of his former glory. Charlie, Bert and Lionel Conacher. By 1938, Conacher retired but was coaxed out of retirement and was sold by the Maple Leafs to the Detroit Red Wings where he played but one season. The 'Big Bomber' ended his career with two seasons as a New York American, but his effectiveness had been reduced significantly and he spent much of the time playing defense. Charlie Conacher retired following the 1940-41 season. Through 459 regular season games, Conacher scored 225 goals and added 173 assists for 398 points. He added 17 goals and 18 assists for 35 points in 49 playoff contests. Charlie's most productive years were the six years between 1930 and 1936 when he led the NHL in goal scoring five times. 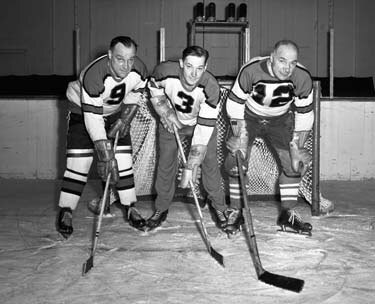 Conacher, the rightwinger on Toronto's exciting Kid Line with Joe Primeau at centre and Harvey Jackson on the left side, terrorized opposing netminders. Primeau finished in the top ten scoring leaders three times, Jackson five times and Conacher also on five occasions. During an era when set lines were de rigueur, the Kid Line topped them all in productivity. Charlie Conacher behind the bench of the Chicago Black Hawks. A series of excellent business decisions set up Charlie well for his post-playing career. He lived as fast as his shot, and his lifestyle was supported by shrewd investments in oil, hotels and stocks. In the summer of 1935, Charlie and his brother Lionel also opened a terrifically popular gas station at Yonge and Davenport in Toronto. He also tried his hand at coaching and spent five seasons behind the bench with the Ontario Hockey League's Oshawa Generals, including a Memorial Cup championship in 1944. 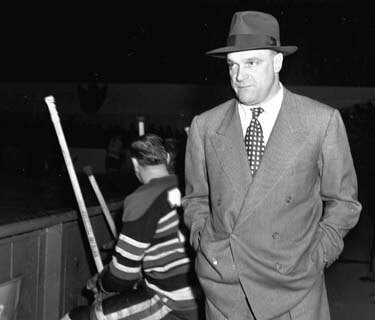 During the 1947-48 season, Conacher assumed the coaching duties with the Chicago Black Hawks, where he stayed until the conclusion of the 1949-50 season. Among the players he coached in Chicago was his brother, Roy. Charlie Conacher was elected to the Hockey Hall of Fame in 1961, later joined by brothers Lionel and Roy. The Conachers are the only family with three members in the Hall of Fame. But the hockey legacy goes further still. Charlie's son, Pete, played in the NHL, as did nephews Brian Conacher and Murray Henderson. On December 30, 1967, one of the most exciting players in the history of the Maple Leaf franchise succumbed to throat cancer, leaving a hockey legacy that can still be recited today. A further legacy was also left. Friends of Charlie raised great amounts of money through annual fundraising dinners, with proceeds directed to research into laryngeal (throat) cancer. Toronto General Hospital was endowed with $4 million that created the Charlie Conacher Research Wing in 1985 (the wing is now gone, replaced with the MaRS Building). The Charlie Conacher Humanitarian Award, also known as the Charlie Conacher Memorial Trophy, was an award named after Conacher that was given out between 1968 and 1984 to the NHL player who best exhibited outstanding humanitarian and public services contributions. 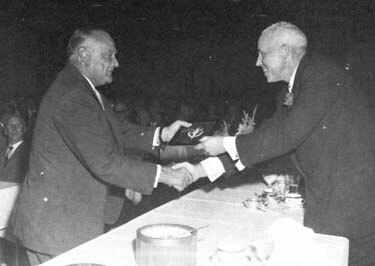 In 1988, the non-NHL award was replaced by the King Clancy Memorial Trophy.